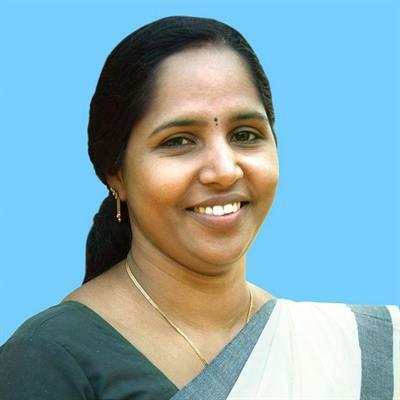 K S Sheeba Alathur 2014 UDF candidate profile and biography is given here. K S Sheeba who entered politics through KSU while as a student later became a part of the Youth Congress. She is currently the chairperson of Chitoor Thathamangalam Municipality. 30 year old Sheeba will be contesting the election from Alathur constituency in 2014. Read more to know about K S Sheeba. K S Sheeba was born in 1984 at Chittur - Thathamangalam as the daughter of late Rukmini and A. Arumughan, who has retired Police service. Being a part of Chenthamaranagar Chingattukulambil Puthenpura Veetil family, A S Sheeba has proved her strong will to lead the people right from her school days. Thathamangalam is a city and a municipality in Palakkad district with a population of 31,884. Chittur which is popularly known as Kerala's Nellara has also contributed a bold woman who is ready to serve the nation and move forward for its development. While studying in College, K S Sheeba has shown a strong will in the ideologies and policies of the Congress party. She was motivated to join the Kerala Students Union (KSU) and later the Youth Congress, the youth wing of INC. After completing her graduation in B.Sc Botany from Nenmara NSS College, She had done her B.Ed from Vellara centre which comes under the Kerala University, Thiruvanathapuram. K S Sheeba is quite a good example of an individual who has rose to popularity fighting against awful situations. She was elected as the councilor of Chittur - Thathamangalam ward. At the age of 27, with no surprise Sheeba was lifted up to the position of Municipal chairperson in 2011. For her active involvement and clean planning in the programmes of the municipality, she won the state award for the best chairperson. Currently being the Chittor Block General Secretary, K S Sheeba is busy studying for her M.Sc from Anna Malai University. She has already acquired a PGDCA diploma in Computer Application. He husband T V Ratheesh, who works with the Excise department at Thrissur do provide all the basic mental support for the young politician. The couple is having a fruitful life spending the part of the day with their 10 months old son Adarsh. In 2014, K S Sheeba would contest the election from Alathur giving a tough competition to his arch rivals who represent the LDF, BJP and AAP. She is the youngest among the candidates who contest the Lok Sabha election in 2014. Her decision to keep away for plastic mixed flex board for the election was well greeted by the public.